rises 16 new pool residences perfectly located within the heart of the upscale residential community set amidst palm tree-lined lagoons surrounded and landscaped gardens. “In a short three decades, Laguna Phuket has transformed from abandoned tin mine to Asia’s finest integrated resort. Over the years, the tourism industry has grown exponentially in Phuket, during which time Laguna Property has established a solid reputation for outstanding quality backed the internationally renowned Banyan Tree Group. With the release of the newest Laguna Village Residences, I am pleased to welcome the latest collection to our Laguna Phuket community,” said Mr Stuart Reading, Head of Property Development, The Banyan Tree Group. Built to the most exacting standards, the grand two-storey Laguna Village Residences each occupy a built-up area of 671 square metres and sit on lagoon-fronting plots of between 1,034 to 1,482 sqm. The contemporary-styled detached homes feature four bedrooms, five bathrooms, one study room, western kitchen, a private infinity swimming pool overlooking the lagoon, extensive gardens, Thai sala open-air pavilion and a spacious sun deck. Homeowners who want to use their property as a primary place of residence, a second home, or private rental property can still enjoy the most from their property with professional property services offered by Laguna including common area management and security, bespoke maintenance and admin services (including maid service, pest control, handyman service, and bill payment), as well as rental services. Laguna Village Residences also offer buyers a choice to suit their investment or lifestyle needs. 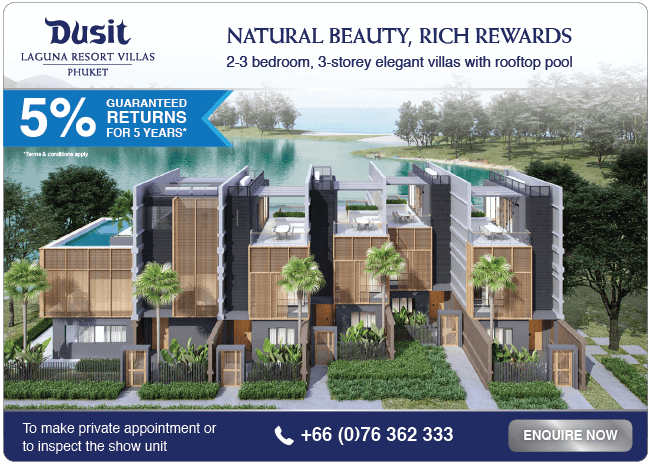 Owners can opt to participate in the full-service rental programme that allows them to maximise returns by having their unit professionally operated by Angsana Villas Resort Phuket and receive rental returns on a profit sharing basis from the programme. With an enviable address in a multi-award-winning destination resort, the homes in Laguna Village Residences offer residents a rare chance to be surrounded by five star resorts and a myriad of leisure facilities including the renowned Banyan Tree and Angsana Spas, 30 bars and restaurants, swimming pools, gyms and sports facilities, a shopping village with a 24hr convenience store and medical centre. A world of privileges and rewards awaits all Laguna Village Residences homeowners, including complimentary membership of The Sanctuary Club, which offers access to properties within Laguna Phuket and across the Banyan Tree network worldwide.